Accent your living room with this simple and elegant upholstered chair. The Newburgh offers traditional style with it's flair tapered arms and rolled back. An attached back and seat features luxury cushions. Exposed wood legs add extra height to this chair. Place this chair in your living room or bedroom as a beautiful accent chair. 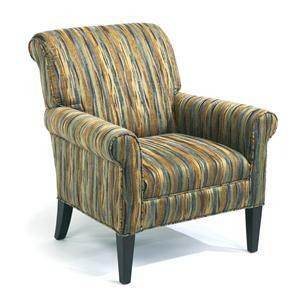 The Accents Newburgh Upholstered Chair by Flexsteel is available in the area from furnishingretailers.com.